The oscillating quiver at the tip of the rod meant the small plug was working. When the motion stopped, it meant either a snag or a striking trout. With rainbows rising all around on the small stocked lake, most of the rod stops were the pleasant kind. After the strike, it was just a matter of picking up the jumping pole and carefully reeling in another tender-mouth trout. Honestly, I wish it was that easy. While trolling small plugs can be incredibly effective for catching spring trout, the technique does require attention to detail. Plugs and crankbaits are generally thought of as bass catchers, and the 3/8-ounce and heavier models are great for that. Most of these plugs have round, bulbous shapes, and many have lips that are way too big for a trout to kiss. For trout, instead, try smaller plugs not really intended for bass, at least not bruiser bass. These come in sizes from 1/16- to 1/4-ounce. Better ones for trout have longer, thinner fish shapes or shapes that seem quite fake in appearance and action. That’s not meant as a knock on the baits, because the least realistic often work best. The Rebel Crawfish, for example, doesn’t move like a live crayfish yet often catches trout. Neither does the stellar Rebel Crickhopper act like a cricket or a grasshopper. And what about all of those slim minnow crankbaits? Have you ever seen a real minnow roll from side to side like they do? Of course not, yet trout love the shimmy and flash. When selecting a plug for trolling, first ask yourself if the bait has enough action without being overly active. You don’t want it to roll wildly or zigzag out of control. At the same time, “do-nothing” baits, those with little or no action, are not particularly alluring to trout. Instead, look for baits that flash and sway on a straight axis. When trolled at slow speed, the bait needs to flutter from side to side without rolling over. The tail, or back end of the bait, should wiggle quickly but not send the bait on a wild tangent. The desired depth is the next consideration when selecting a plug to slow-troll for trout. Best are floating-diving models that stay in the 2- to 5-foot range. Tricks can get these baits deeper, if necessary, but when the manufacturer increases the depth range, the size of the bait increases with it, and it may be too big for trout. Again, we’re talking about stocked trout in small to medium impoundments, not some beast of a trout in a bottomless lake. While a lot of anglers use any old rod and reel for trolling (understandable in this economy), I want a rod with a medium-light action, one with a fast tip that reveals the wiggling of the trolled plug. Depending on how many anglers we have in the small boat, we may use rods from 5-1/2 to 7 feet long. Place shorter rods in the stern and longer rods along the hull and towards the bow. This spread helps avoid line tangling. If I’m running where I expect snags, I use 8-pound-test line to help prevent the loss of lures. But where snags are not a problem, I use 6- and even 4-pound line. Four-pound is strong enough for most of the trout stocked in small impoundments and allows for great action as well as the ability to get maximum depth from a small crankbait without adding weight. Fluorocarbon line seems to increase the number of strikes, especially when slow-trolling, and you don’t have to fill the entire spool with expensive fluorocarbon. Instead, tie on a 3- to 4-foot leader using a small, black barrel swivel. Even if you don’t use a fluorocarbon leader, a barrel swivel connection helps prevent line twist. Another nice ploy is to spray the line with Real Magic lubricant and softener. A squirt on the spool before you start fishing, and again at the first sign of line twist, can save a lot of headaches. When trolling more than one small crankbait, first make sure they are compatible at the selected trolling speed. Not every bait is going to work well at the typical slow-trolling speed of .4 miles per hour. One bait may barely roll and flash while another turns wildly. To determine compatibility, drop both baits over the side of the boat and see how they work at the same boat speed. If a thin minnow plug trolls properly but a small crayfish appears to be out of control, then you must find something to replace the crayfish. The hardest thing to determine when slow-trolling is the correct action for the bait. Since it isn’t universal, it must be done by trial and error. Sometimes, I can just watch the motion of a trolled bait and know it isn’t right. Other times, a plug looks OK in the water but doesn’t catch fish. When that happens, I may change trolling speed gradually until I get a bit different action from the lure. Slow trolling speed is best controlled with an electric motor. However, don’t think you’re at a disadvantage if your only power is a pair of oars. As long as you can row smoothly and without a lot of commotion, slow-row trolling can be just as effective as slow-electric trolling. For many years I only used oars and caught plenty of trout. I still use the oars when renting a boat at a nearby lake. One favored tactic is more effective when rowing than when running the electric motor. When trolling a floating/diving plug, suddenly stop rowing and dip the oars. With the boat’s forward motion halted abruptly, the bait hesitates and then wiggles up through the water column, an action that triggers plenty of strikes. Don’t wait until the bait reaches the surface to resume rowing. That doesn’t work so well with trout. Instead, resume rowing while the lure is still rising, and you may impart a sudden darting dive, which defintely triggers strikes. You could try this with an electric motor, but there is more glide after shutting down the power. It works best when you can dip the oars and instantly brake the boat. Of course, electric motors do have their pluses. You can easily change direction by small increments, maintain consistent speed or change speed as necessary. The trout don’t always want the stop-and-go approach but may prefer a slow, steady pace that is only achievable with a trolling motor. A bait worked with an electric motor can maintain depth and action over a longer path, and sometimes this is the trigger trout need. Regarding speed, give the throttle a little more juice when working into the wind. 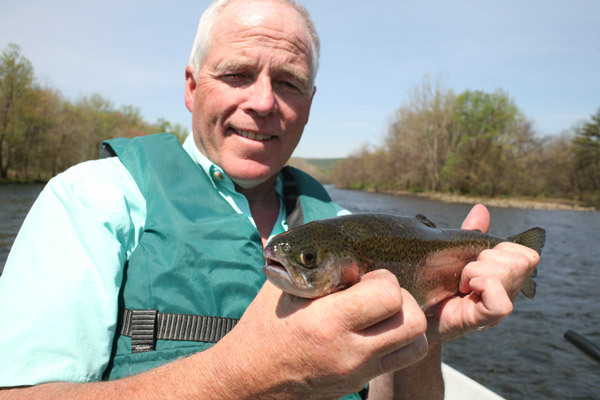 I’ve noticed that trout often hit while the boat is going with the wind but not on the return passage when the wind is in my face. The same can apply in reverse, when the trout seem more inclined to take the bait when the boat is heading into the wind. I suppose it’s possible the fish are only looking one way or the other, but I suspect the lure’s action is either aided or impaired by the changing boat speed or the direction of the current. The electric motor is also helpful for making the little zigs and zags that also sometimes trigger trout. 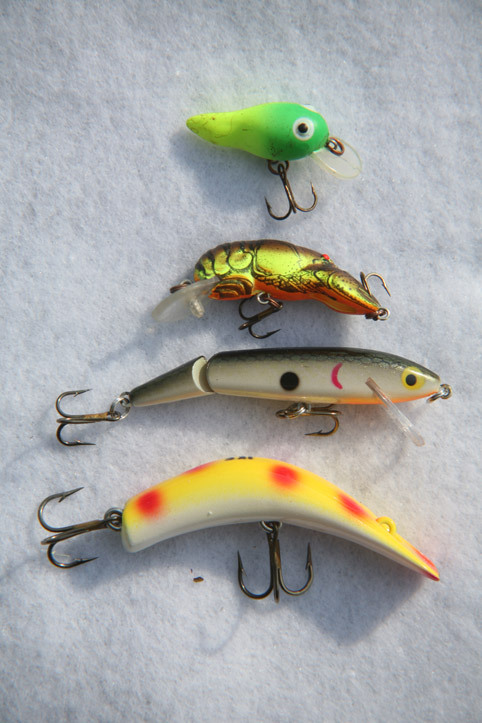 Give the boat a slight turn, and the trolled lure will duke a little left or right. I like to make a few quick zigs and a few slower zags to see which elicit strikes. I’m not talking about hard 45-degree turns, just little course corrections to slightly alter the trolled bait’s speed and direction. When you do need to make a hard turn to go in the opposite direction, take multiple lines out of the water. Unless you make a wide enough turn, those lines will surely tangle. In early morning and other periods of low light, I generally run baits 2 to 5 feet down. When the sun brightens, I increase depth from 5 to 7 feet. Much deeper than this, I typically switch to other baits and fishing tactics. However, I may quickly achieve some extra depth with a small plug by simply crimping on a split shot or two above the barrel swivel. The very best way to add weight is to retie and use a small bullet weight, pegged up against the swivel. The cone shape is more hydrodynamic than the round shot and doesn’t interfere as much with the action of the lure. A 1/8-ounce bullet usually gets me down to the desired depth. Often, I see lake trout rising for natural flies on the surface, particularly for caddis or midges. When this occurs, forget the time of day and troll higher in the water column. Although the fish are taking natural flies, a trout will swipe at a small plug trolled right in its face. Some of my best midday fishing has come when the trout were rising for flies that my plugs did not mimic in any way. As for crankbait shape, try a number of different “insect” baits: crickets, grasshoppers, beetles, bees and worms. When the action is right, they are hard to beat. Just be aware that a lure that works in one size may not have the same fish-attracting action in a different size. When you want to fish a small lure deep, it’s hard to beat the nearly forgotten 1/4-ounce Lazy Ike. Slender minnow plugs, the Rapalas and Rebels, are also good choices for slow trolling; I recommend the jointed versions. While most anglers drop anchor in a good spot and offer natural or manufactured baits, slow-trolling covers more water and frequently catches more trout, too.